Journalism’s relationship with the public is at the brink of crisis, if not already in the throes. Public trust in journalism is in decline and to restore confidence, the industry needs to ramp up efforts and engage in trust building exercises. The Reuters Digital News Report 2017 found that trust in journalism is in decline, falling globally by 7 per cent. While the level of trust in Ireland is above the global average, the sharp decline internationally should be taken as a stark warning. Ireland is not immune. 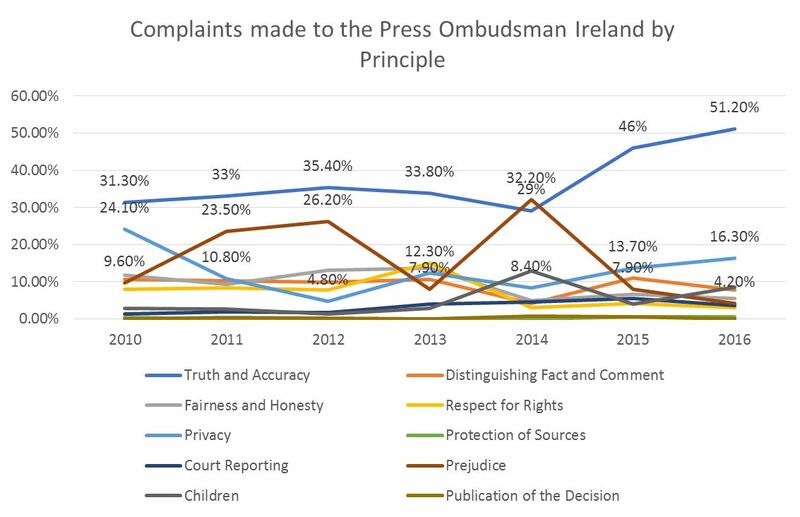 Complaints to the Press Ombudsman of Ireland about truth and accuracy have risen by almost 20 per cent in recent years. The data reveals what people are complaining about, as opposed to the number of errors in news titles, and although it is not a measure of public trust, it is an indicator that concern over the truthfulness of journalism is increasing among Irish news consumers. The 2016 Annual Report says that while “the press in Ireland continue to provide a generally reliable news service”, it also warns that “if the press is to maintain its relevance in public life it is essential that those who look to the press for information, background, context and debate find accurate reports of events.” However, the data indicates that when the audience go looking, they increasingly perceive problems with truth and accuracy. Fake News and Political Polarization: The findings of the International Digital News Report 2017 indicate that the decline in trust is linked to concerns about political polarisation in the news media and “a generalized scepticism toward most of the actors that dominate the contemporary information environment.” Central to this debate is the issue of fake news and misinformation and further research into audience perceptions indicates that the term is too narrowly defined by newsmakers. Audience interpret fake news on a spectrum that includes, at one end, political bias and poor journalism and deliberately fabricated content at the another end. The report suggests that, “tackling false news narrowly speaking is important, but it will not address the broader issue that people feel much of the information they come across, especially online, consists of poor journalism, political propaganda, or misleading forms of advertising and sponsored content.” It will not be sufficient for individual organisation to try and plug the gaps. If the problem is at an institutional or industrial level, the response needs to be at this level too. Trusting News in Contentious Public Debates: Journalism is still the fourth estate of democracy (the other estates being the legislative, the executive, the judicial, and a fifth estate loosely referring to other informational support groups). Audiences need journalism to empower them with accurate information, which is essential for informed decision-making come election time. Citizens need to be able to trust the information they get, and journalism needs public trust if it is to be meaningful. Ahead of a year of referendums in Ireland, followed by European elections, a possible presidential election and not long after a General Election, Irish journalism should take stock of international events and prepare for further political polarisation and the decline in trust that comes with it. The news media is under attack unlike ever before – and unless it defends itself, it will die a death of a thousand cuts, or tweets, or misleading media bashing blogs. At an institutional and organisational level, it must make extra efforts to validate its role in society and value to citizens. The problem will not rectify itself. What is working? Internationally, there are several efforts designed to improve the quality of journalism and build trust. Some experiments work better than others and the nature of the media market is an important factor in the success of projects. But what is important to note is that institutions no longer expect trust, they know they must engender it through producing better journalism and working with audiences. Collaborations and Cooperation: When power couples of journalism get together, everyone benefits. Pooling resources and working together on dedicated projects helps improve the overall information environment. Given the speed of digital news flows, exclusives have a short life-span before they appear on competitor websites. When limited resources are pooled and negotiated to avoid duplication, the outcomes have been beneficial for all the stakeholders. Collaboration in the digital news marketplace makes sense. So, what are organisations doing? With limited resources to dedicate to training and the development of fact-checking, news organisation work with third party fact-check services to supply accountability journalism. There are more than 100 fact-checking organisations internationally working with news industries and audiences. On the back of misinformation during the US Presidential Election and Brexit and before the recent Presidential Elections French, news organisations prepared for an onslaught by working on a collaborative fact-checking project. Seventeen newsrooms put aside competition and worked with Google, Cross-Check, and Facebook, to debunk and verify information contributing “their own experience, resources and regional knowledge to speed and strengthen the verification process.” And the outcome appears to have been a less polarised environment and more nuanced debates ahead of the election. Although more research is needed before it is replicated. Other initiatives include news organisations partnering with investigative journalism groups such as the International Consortium of Investigative Journalists (ICIJ) to bring stories that would be almost impossible otherwise. This had led to ground breaking journalism on major stories such as the Panama Papers and Paradise Papers. There have been trails of national organisations working with researchers, data scientists, regional press, and across platforms to produce beneficial journalism that would be too challenging for any one of the organisations alone. For consumers, they become more than the sum of their parts and for the organisations, the high tide lifts all boats. Working with Readers: Media literacy is often used as a catch all concept for improving trust. However, it is improved media literacy that left journalism so exposed to public criticism in the first place. Audiences understand there are factors shaping their news – from political biases and media ownership to clickbait cultures and advertiser influence. This, in part, enables the critical evaluation of news and the news industry. What is less well known, are the ‘hows’ and ‘whys’ of journalism production. In this regard improving transparency by working with audience to help them better understand the industry and how individual organisations work has proved beneficial. It acknowledges that some criticisms are legitimate and responds helpfully. Public Editors that take the temperature and address concerns, reader centres that seek meaningful responses from consumers, media desks that go beyond the business of journalism and evaluate its public functionality, all efforts that make audience feel heard and understood help build confidence. Working with readers and enhancing transparency pays-off and not just in terms of trust. 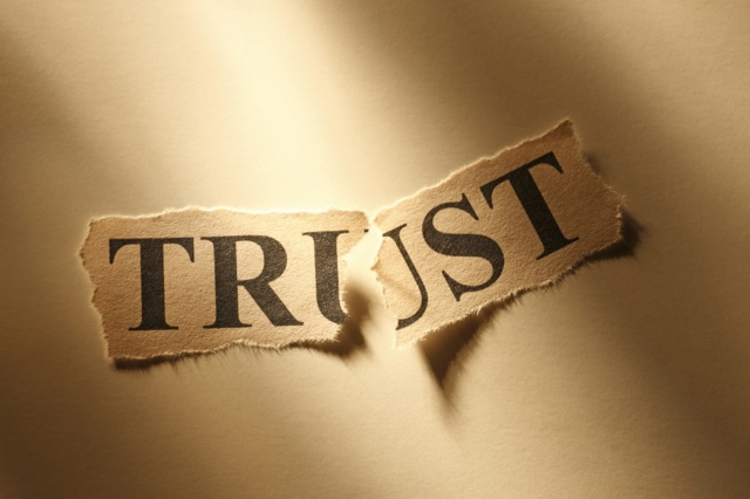 Consumers will not pay for what they view as bad value and what they cannot trust. Organisations that conscientiously engage with readers, such as The New York Times, The Guardian and Washington Post have all seen increases in their subscribers, increasing revenue, and improving the resources for better journalism. The have built a community around their credibility and it works. For now, the Irish news and political environment is somewhat more stable and less polarised than elsewhere. But complaints about truth and accuracy indicate that that concerns are rising, and public trust is at stake. Preparations for divisions to widen in the face of multiple referendums, some with the potential to sow deep divisions, could prevent toxification of the news environment at a time when public trust in journalism is most crucial and most vulnerable. Next Will Trust Indicators Boost Quality Journalism?